Nice – you should look at Linnea Strid’s paintings with similar themes. As the dusk descended, and Victoria Duval continued her c comeback, the crowd at Louis Armstrong Stadium seemed to evolve along with her—Zach Schonbrun reports for The New York Times. She began as a relative unknown facing Samantha Stosur, the world’s 11th-ranked player and the 2011 United States Open champion. By the third set, she was “Vicky” — the United States Open’s new fresh-faced darling, a 17-year-old qualifier from Haiti with the lightning quick forehands that belied her thin, goggles-wearing appearance. It grew apparent, too, that Duval was not just putting on a nice show to cap a long day session of matches. She was a player, sending Stosur scrambling after wicked returns and deftly capitalizing on Stosur’s 56 unforced mistakes. The war in Syria is a political war for power and political gain in Syria. It is war as war used to be, so to speak. Wars that could be settled, often waged by evil or brutal men, but with tangible and identifiable aims. Why should the United States intervene or escalate this Syrian civil war? Syrians started it. No one except Syrians can put an end to it. Anyone who tries risks becoming part of it. via William PFAFF-More War in Syria – Columns – News. any other international actor who might seek advantage in an American intervention in Syria that would spread the war, possibly to President Assad’s regional allies, Iran and Lebanon’s Hezbollah, already active clandestinely. All they needed was for rebel forces to obtain a supply of lethal gas and attack their own people. It would not do for them merely to attack Assad loyalists. That would alarm the international community, but not outragc it. The rebels would be acting logically, and international sympathy has tended to be with the rebels. The only way Mr. Obama’s “red line” would be crossed would be if the rebels contrived to kill their own countrymen (actually, preferably their countrywomen and children) — in a way that would lead Americans and the international community to believe this actually had been done by Syrian government forces. This now is what is supposed to have happened. 28 AUGUST 2013 – WHO has been informed of an additional eight laboratory-confirmed cases of Middle East respiratory syndrome coronavirus (MERS-CoV) infection in Saudi Arabia. The cases include two men with underlying medical conditions from Riyadh who died, three women and one man, also from Riyadh, and two men from Asir region. Additionally, a previously laboratory-confirmed case from the United Arab Emirates has died. a 55-year-old man from Asir who is a contact of a confirmed case, and is asymptomatic. “The horse is our medicine,” states the resolution of the Nahooka Dine’, traditional Navajo medicine people opposing the slaughter of the horse. The resolution was passed by traditional Dine’ practitioners gathered at lower Black Mesa. “The Horse is our medicine and has helped us survive many hardships, they must be given respect and honored for their sacred place within the Creation, as they possess the same fundamental right to Life as we, Five Fingered Ones do,” says the resolution passed with 32 in favor and none opposing on Aug. 26, 2013. Nohooka Dine’ said the capture, imprisonment and slaughter of horses threatens traditional Dine’ spirituality and culture. Further, the medicine people said that the Navajo Nation government’s support of horse slaughter violates the way of life and being of traditional Dine’, the Ke’. Nahooka Dine’ said the UN Declaration on the Rights of Indigenous Peoples requires both the Nation Nation and United States governments to consult with Indigenous Peoples who are guaranteed the right to free, prior and informed consent. Leland Grass, Dine’, told Censored News, “The resolution was passed by the Elders and Medicine people, most of them don’t know how to read and write, or speak english. via CENSORED NEWS: Navajo Medicine People Oppose Horse Slaughter ‘The Horse is our Medicine’. via David Ignatius: In Syria, U.S. credibility is at stake – The Washington Post. My own gut tells me that this is a war worth fighting. But I’m bothered that America still hasn’t had the kind of broad national debate that would provide a solid foundation of public support for sending U.S. troops into battle. In an echo of the tactics they used to promote U.S. intervention in the Balkans, Iraq and Libya, a familiar clutch of neo-conservatives published a letter Tuesday urging President Barack Obama to go far beyond limited military strikes against Syria in retaliation for its government’s alleged use last week of chemical weapons that reportedly killed hundreds of people. Signed by 66 former government officials and “foreign policy experts” – almost all of them strongly pro-Israel neo-conservatives – the letter, which was released by the Foreign Policy Initiative (FPI), called for Washington “and other willing nations [to] consider direct military strikes against the pillars of the Assad regime” as part of more ambitious strategy to support “moderate” Syrian rebels and dissuade Iran from developing nuclear weapons. via IPS – U.S. Neocon Hawks Take Flight Over Syria | Inter Press Service. “I suspect [Cameron] has the same muscular internationalist reactions as Blair did,” Paul Schulte at the Centre for Defense Studies at King’s College in London told DW. Schulte previously worked as a UN disarmament commissioner in Iraq. “It’s about saying that world order can be molded, decisive countries can make a difference and Britain should be one of those countries and should join in that effort to affect the evolution of international norms – at least stop them falling back,” he continued. via UK’s Syria stance sounds echoes of Iraq invasion | Europe | DW.DE | 28.08.2013. U.K wants ‘all necessary measures’ authorised at U.N. – The Hindu – So Cameron can look good and tough! If it worked for Tony Blair, it should work for me who wants to get re-elected too! The Cameron government does not want to wait till the United Nations forensic inspectors, currently in Damascus, submit their report. The U.K. is submitting a resolution to the Security Council of the United Nations to give it the opportunity to “live up to its responsibilities on Syria”, the Prime Minister’s office said in a press statement, “while condemning the attack by the Assad regime, and authorising all necessary measures under Chapter 7 of the U.N. Charter to protect civilians from chemical weapons”. via U.K wants ‘all necessary measures’ authorised at U.N. – The Hindu. 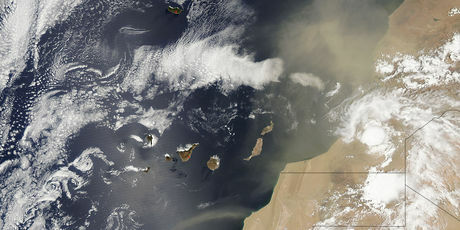 Each summer, microscopic dust particles kicked up by African sandstorms blow thousands of kilometres across the Atlantic to arrive in the Caribbean, limiting airplane pilots’ visibility to just a few kilometres and contributing to the suffering of asthmatics trying to draw breath, the Associated Press reports. The phenomenon has been around as long as there’s been sand in the Sahara Desert. But it’s attracting ever more attention from regional scientists who say the clouds have grown, even if there’s no global consensus on the issue.